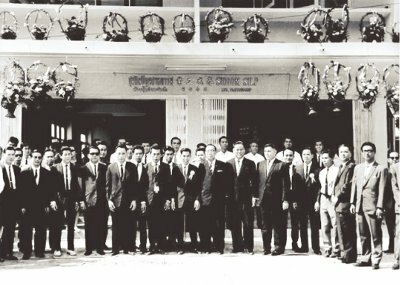 IN 1966 MR.SATIEN YOUNGVANICH BEGAN HIS CAREER OF WELDING COMMERCIAL STAINLESS STEEL FREEZER AND KITCHENWARE FOR VARIOUS HOTELS AND AIRLINES UNDER THE NAME OF "SHOOM SILP INDUSTRIES LIMITED PARTNERSHIP". STRUCK BY SCRAP LEFT FROM THE WELDING, HE DEVELOPED A CREATIVE IDEA TO UTILIZE THE SCRAP ALSO TO IMPROVEMENT THE QUALITY OF SPOON IN THAT DAY, AND THE INITIATIVE TO IMPROVE THE PROCESS OF HIS WELDING INTO INDUSTRY MASS PRODUCTION. HE, THEREBY, BEGAN TO PRODUCE THE "STAINLESS STEEL SPOON", WHICH WAS THE FIRST PRODUCTION OF ZEBRA IN 1968. THE COMPANY NEVER STOP TO IMPROVED AND DEVELOPED ITS PRODUCTION TECHNOLOGY. PRESENTLY, SATIEN STAINLESS STEEL PUBLIC COMPANY HAS WITH IT 200 MILLION BAHT REGISTERED CAPITAL, 1,000 PERSONNEL, AND MORE THAN 2,200 CATEGORIES OF PRODUCTS. OUR FACTORY IS ONE OF THE MOST ADVANCE HI-TECH FACTORIES IN ASIA, WHICH HAS BEEN CERTIFIED OF INTERNATIONAL STANDARD OF QUALITY, ISO 9001:2008 BY TÜV RHEINLAND, GERMANY AND ENVIRONMENTAL MANAGEMENT SYSTEM ISO14001:2004, BY TÜV SÜDDEUTSHLAND GROUP, GERMANY. Prime Minister's Export Award 2004 for The Best Exporter 2004 from the Export Award Selection Committee, The Ministry of Commerce. Prime Minister's Export Award for Best of the Best 2011 from the Export Award Selection Committee, The Ministry of Commerce. Certificate THAILAND Trusted Quality in name of “Thailand Trust Mark (TTM)” by Department of International Trade Promotion, The Ministry of Commerce. Copyright ©2004 Satien Stainless Steel Public Company Limited. All rights reserved.